Having pets, kids, or a combination of both may lead to a little bit more worry in the upholstery department. There are cat claws, stains, spills, and general wear and tear to worry about! Or perhaps you have a summer home with a more relaxed lifestyle. Either way, the key is to be prepared and get the best upholstery that will hold up to these factors. So, what upholstery is best in these scenarios? There are a lot of factors that go into this, and it depends on what you’re looking for. But high-performing, stain-resistant fabrics are a great place to start. In most cases, we recommend getting a furniture protection plan for your upholstered furniture. Especially if you have pets, kids, or you just don’t want to be worried about stains and spills! Although the furniture protection plan covers all furniture and upholstery, it will be an especially good idea if you choose a fabric that does not have a high cleanability—like linen. Our 5-year UNITERSPure Protection Plan (learn more here) will give you the freedom to not worry if there is damage made to your upholstery. You can call them any time and as many times as you need to clean your furniture. The plan also includes 1 full replacement within the 5 years if need be. The price of the plan is dependent on the value of the furniture you’re purchasing and ranges from approximately $99 to $999. In general, you’ll want a fabric with a tight weave. The best and most luxury example of this is Ultrasuede. It’s perfect for cats as their claws will not penetrate the fabric. It’s unique in that it isn’t a woven fabric and is extremely dense. Odor doesn’t penetrate it, and it’s resistant to pilling and fading. Do be aware that it can attract pet hair. Ultrasuede comes with a 10 year warranty. Microfiber is a great more affordable option for pets. It’s highly cleanable, durable, and has a tight weave. You may choose leather as it’s aesthetically beautiful, durable, and easy to clean. A protected leather will be more durable. If you choose a distressed look leather it will be easy to hide scratches and marks. Ultrasuede and microfiber are great options for kids and general wear and tear. However, if you’re concerned about spills and stains, Crypton will be your best bet. It’s an antimicrobial fabric with a liquid barrier that repels stains. Leather is also a great option in terms of cleanability and durability. Every second home is different and what you’re looking for will differ depending on how you use the home. If your second home is by the beach and you have a lot of sunlight coming in, you might opt for Sunbrella. It is widely recognized as being the best anti-fade fabric. It’s easy to clean and perfect for window seats and deck furniture. Another beautiful option for a beach home is linen. It’s a beautiful, natural fabric that breathes and, like leather, gets better with age. Please note that linen doesn’t have any inherent stain protective properties, so if you opt for linen getting a furniture protection plan will be your best bet. Leather is a great choice for a cabin. It’s easily cleanable, looks beautiful, and gets better with age. Do be aware if you have a wood stove near a leather sofa it’s important to keep the leather moisturized. Of course, many of the performance fabrics can be used in multiple cases. It really comes down to what’s important to you, and whether you’re looking for anti-fade, anti-stain, or durability. Or perhaps a combination of all three! For an in-depth review of the performance fabrics we carry, read more here. The fabric you choose is very important when it comes to pets, kids, and second homes. It may also be worth considering what style of upholstery you choose. A tight back sofa or chair, like the Blake sofa and Sally chair, is a great option for a second home. It gives a neater appearance to the room and it means you don’t have fluff cushions. 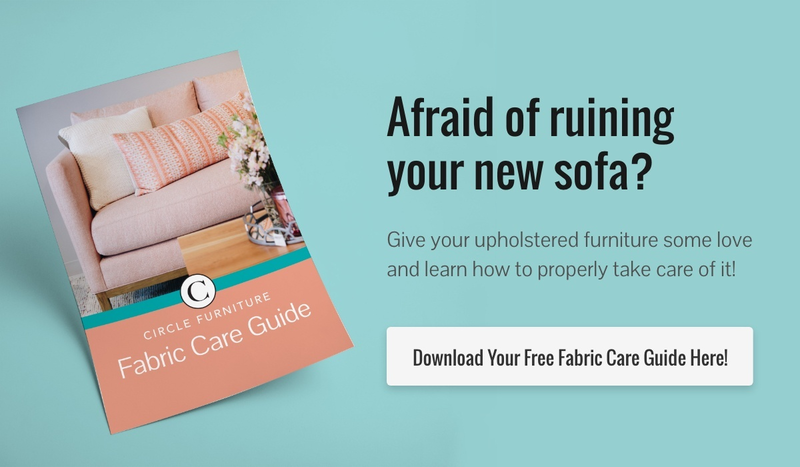 Learning how to take care of your furniture is important! Regular vacuuming and cleaning will extend the longevity of your upholstery. Learn more about how to care of your leather furniture here. The goal in choosing fabric for kids, pets, or summer homes, is to be worry-free. Taking time to choose the fabric carefully and/or protect it with a warranty will take a lot of the weight off your shoulders. Once you’ve weighed the options, come into one of our showrooms to chat with a designer. Regardless of what you’re looking for, they will ask the important questions and guide you through the process of choosing upholstery. Get to know our designers!